For 76 years, Mexico’s state-owned oil and gas company Petroleos Mexicanos (or Pemex) has had a near monopoly over the country’s oil production. However, 2015 would be its 77th and final monopolistic one as Mexico prepares to open up oil exploration and production to foreign and domestic private sector participants. Declining production levels for the last 10 years seem to have forced the government’s hand to invigorate the sector and shake-up Pemex. Mexico currently produces around 2.5 million barrels per day (bpd), nearly a million less than it did in 2004 when production peaked. Some still say the reforms did not go far enough. Yet by Mexican standards, it’ll be one heck of shake-up for a state-owned oil and gas company which has never competed itself to bid for overseas exploration rights (unlike many other state-owned behemoths especially from China and India). Pemex will have a new board of directors, procedural overhauls, process streamlining (at least on paper) and for the first time in its history face competition from private sector participants. 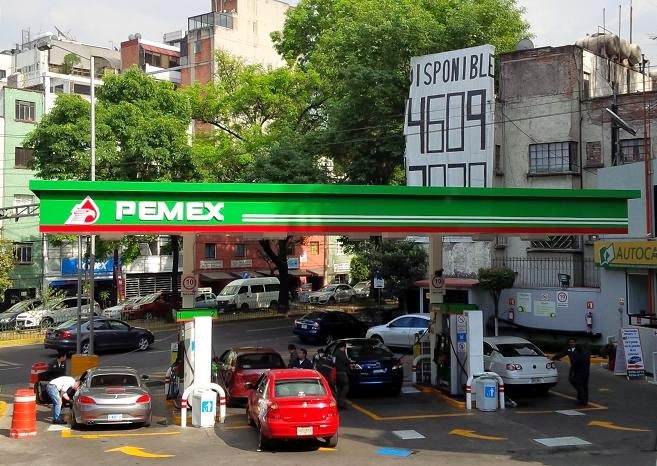 If all that wasn’t enough, Pemex will allow its petrol stations and forecourts to compete with each other on price at the pump for the first time ever. However, nothing is ever plain sailing in Mexico. The general public has largely embraced the change so far but some union leaders who carry considerable clout haven’t and are peddling alarmist ideas about an American takeover of Mexico’s precious resource. A negative vote in a referendum on further changes could bring things to a grinding halt. While the oil price decline is worrying, commentators say market volatility is not enough to derail things as one noted earlier. As for Pemex, Moody’s seems to suggest it is on the right track. On Friday, it affirmed the ratings of the state-firm and its subsidiaries, including Pemex's A3 and (P)A3 global long-term ratings with a “stable” outlook. Moody’s notes that despite significant changes arising from the new energy law, Pemex will remain closely linked to the government of Mexico, which will continue to provide strong support, given the company's importance to the government's budget, to the oil sector and to the country's exports. In the short to medium term, Moody's does not expect any material reduction in Pemex's tax burden and its debt amount is likely to rise to fund higher capital expenditures. “However, its managerial and budgetary autonomy will increase, improving its efficiency,” says Moody’s analyst Nymia Thamara Cortes de Almeida. While Moody’s reckons Pemex will be able to maintain its production level around 2.5 million bpd level for three years at the very least, the government thinks it’ll be able to do so for the next 15 years! Suitably modest as usual! In the so-called “Round Zero” allocation last year, Pemex was still given rights to 83% of all proven and probable reserves in Mexico. But in “Round One”, scheduled to end by September 2015, Peña Nieto administration will put tender 169 blocks covering 28,500 square kilometres open to private participation in (or without) cooperation with Pemex. A major test will come if an oil major gets drilling without Pemex and it’s not inconceivable given the pace with which things are moving here. The government is seeking oil and gas foreign direct investment in the range of US$50 to 60 billion by 2018. Over the course of three days, the Oilholic has spoken on and off record to several market participants. Mood here is upbeat to begin with and several commentators also said Pemex had given them direct feedback about wanting to put its house in order. It's early days so lets see how this plays out. The biggest question in a bearish market, is whether investors, especially foreign investors and IOCs would buy the idea of entering the Mexican oil and gas sector. The Oilholic intends to explore this in greater detail from Houston and London over the coming weeks and months. However, one thinks it won’t be easy convincing the private sector especially when it comes to bidding for subsequent exploration rights offers. The initial and most lucrative exploration rights were given to Pemex. The next round puts forward exploration rights to areas where there is only a 50% chance of finding and tapping out the crude stuff in an economically viable fashion. In the following round, the probability percentage falls to 10%, and the ultimate round would see potential suitors vie for untested prospects. If the Oilholic were a bidder, this doesn’t really fill one with confidence from the outset. It’ll all depend on the terms on offer and the jury is still out on that one. One thing is for sure, with Mexico’s proven oil reserves standing falling from 5th to 18th in the global league table, no one is opening that premium tequila bottle just yet. Much will depend on Pemex's capacity to finally embrace change. That’s all from Mexico City folks as an amazing but short trip comes to an end! Next stop, Houston Texas! Keep reading, keep it ‘crude’! © Gaurav Sharma 2015. Photo 1: Pemex Petrol Station in Mexico City, Mexico, May 2015. Photo 2: Pemex Signage © Gaurav Sharma.